Honour a loved one through donations in lieu of flowers at a funeral or memorial service. Losing someone you love or care about to GI cancer is very difficult but sometimes these final moments can make a lasting difference to others. In lieu of flowers, please consider “In Memory” donations. You can honour a loved one by supporting innovative research and improving the health outcomes for future generations. We are able to support you in setting up an online fundraising page which can provide a simple way for people who knew your loved one to make a donation in lieu of flowers – whether they are able to attend the funeral or not. Alternatively we are also able to provide you with personalised donation cards & envelopes to distribute to those attending your loved ones funeral. For more information, please contact our Donor Relations Coordinator on 1300 666 769. Setting up a regular donation dedicated to a loved one who has tragically passed away from this disease is easy to arrange. A number of our supporters have indicated that a small amount each month is easier to manage, alongside other financial commitments, whilst still contributing to the breakthrough GI Cancer research. This method of giving also provides you with the opportunity to let us know your regular charity donations are in tribute to a special someone. We will also be able to tell you at any stage how much you have contributed in honour of that person. Regular giving allows us to more effectively plan our research grants to ensure we have the resources necessary to fund the quality grant applications we receive each year. 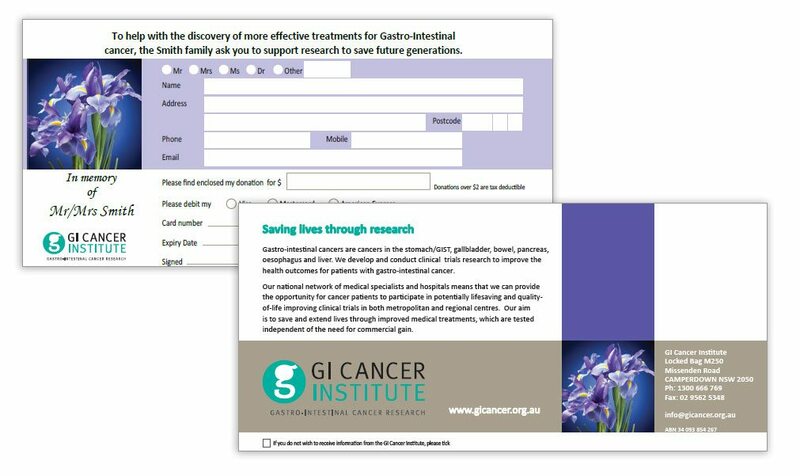 A $30 deduction from your bank account each month for example, can be managed by many amongst their other expenses, whilst making a big difference to our ability to deliver quality clinical trials for GI cancer patients. For more on regular giving and how it works click here.